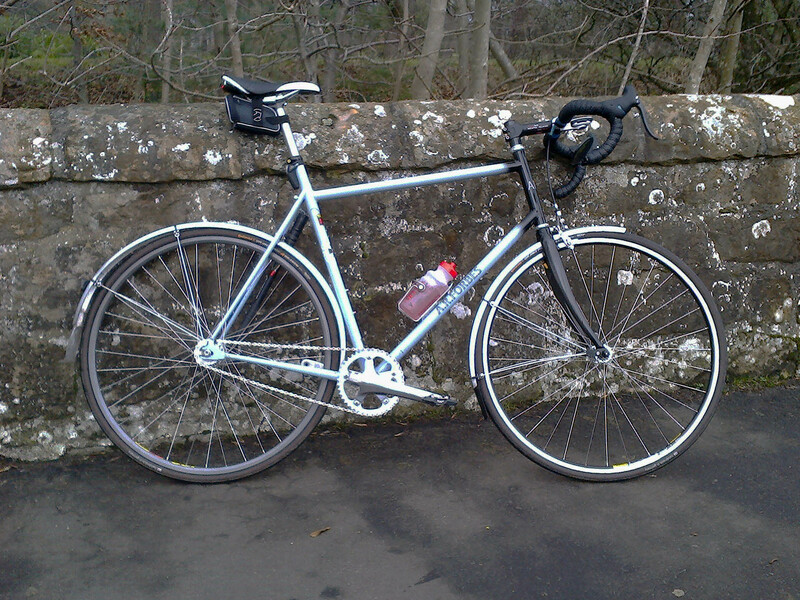 I’ve been fairly lazy this last few weeks so to make amends I headed out west on the mudguarded Winter Fixed today. I might be a moaning bugger about the creeping rise of “Americanisms” in our language but there’s a couple of terms I really like. Badass is one and it’s been happily adopted by cyclists, denoting those who would eschew wind and rain and all adversity to get those training miles in. Folk like legendary Belgian pro Johan Museeuw who fell in the Paris-Roubaix race – a race he’d previously won – and so badly injured his leg that it was touch and go whether it was amputated. The next year he retuned and won it again. The same man whose climb of the Kapelmuur was done in the big ring. A true Hardass – even if some of his performances were later admitted to as being chemically-enhanced. We cyclists have plenty of examples like this to keep in our heads when we face the mere wind and rain in an attempt to be just a little Hardass. So out into the elements today went I, and on leaving the built-up areas of town soon found the wind was quite extreme. Not just the expected steady West headwind either but a Libeccio – that’s a South-Western and in gusts so strong that I was riding along hanging off the side of the bike – which was a bit disconcerting when the gust suddenly dropped. I had planned a good long ride today but after some extremely hard slogging with rather too many deviations from a straight path I turned for home and zig-zagged my faster way back, musing on that other web-spread word and thinking there’s just a fine line between Badass and Fucktard. This Post was posted in Cycling and tagged Badass, Cycling, Fixed-wheel. Bookmark the permalink.